“We were made as cousins because our mothers couldn’t handle us as siblings,” is how the old saying goes. Many times, our cousins are like our siblings and often become our best friends in life. On July 24th, we get to celebrate this part of our family with National Cousins’ Day! 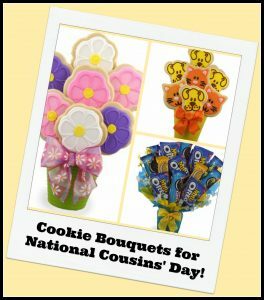 Here are three cookie bouquets you can send your cousins on this day to show them just how much they mean to you. Blooms Cookie Bouquet – This adorable cookie bouquet could be an edible stand-in for a floral arrangement on Cousins’ Day! 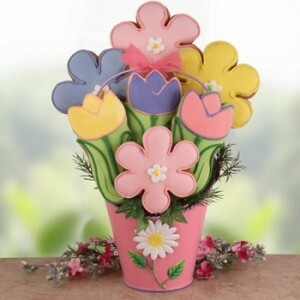 With it’s unique display of flower-shaped cookies, all arranged in a “Flower Pot”, whatever cousin receives this cute bouquet is sure to be surprised and have their sweet-tooth satisfied! Oreo Cookie Bouquet – For the Oreo-loving cousin in your life, this cookie bouquet is everything they’ve ever dreamed of and more. It has a variety of this best-selling cookie for them to nosh on, and will surely bring a smile to their face on July 24th! Furr-Ever Friends Cookie Bouquet – Not only are your cousins your family, but they’re friends you’ll have forever, too. Celebrate them on July 24th with our Furr-Ever Friends Cookie Bouquet, and let them know that you’re grateful for their friendship throughout the years. Want to see the rest of our cookie bouquets? 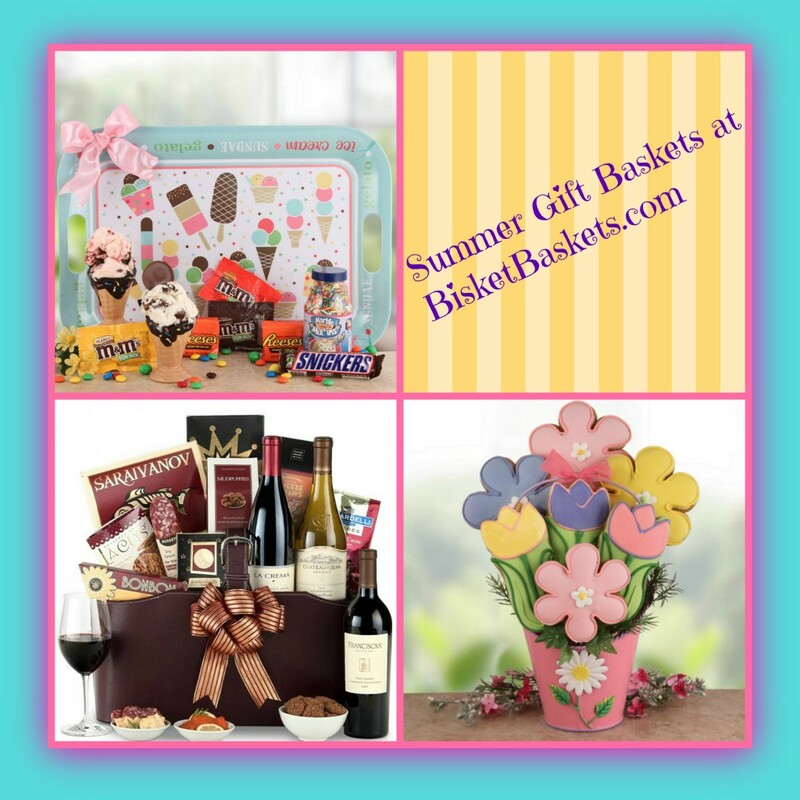 Visit us today at BisketBaskets.com! So someone you know and love just started college, and you want to surprise them with something delicious to help them get over some age-old homesickness. Chances are your college freshman is basking in some new-found freedoms so an unexpected visit from Mom and Dad may not be the best bet. Surprises that never go unwelcomed – no matter how old your undergrad gets – are college care package gift baskets. Give them a break from the food court with one of these packages – you’ll thank us (and they’ll thank you) later! Late Night College Care Pac kage – College is full of caffeine-fueled late night study sessions. You can help get your college freshman through some of his/her firsts with this tasty array of snacks! With yummy munchies, protein-packed peanuts, chocolatey goods (nothing wrong with a little sugar rush) and more, this package will be a necessity for their first months away from home. Dorm Room Pizza Kit – Two important words in every college freshman’s vocabulary are “pizza party.” Offering a slice of pizza is equivalent to extending a hand of friendship, so you can rest easy knowing your undergrad will have no issue making new friends in their dorm. They certainly won’t have an issue devouring this pizza either!. 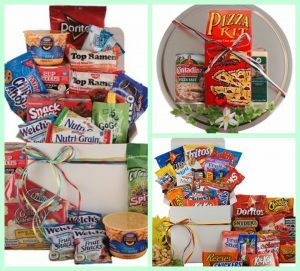 College Survival Care Package – This catch-all care package has everything the college standards: Ramen, popcorn, Easy Mac, Cup Noodles, and plenty more! Any craving your freshman has can be satisfied with one of the wide variety of items in the college survival care package. There are even more goodies you can send along to your new college co-ed at BisketBaskets.com. Show them you care with one of our special treats that will leave them full and thankful for the wonderful adult in their life. Mom. Why not tell your mom you’re thankful for everything she’s done with a delicious cookie bouquet that’s just as sweet as she is? 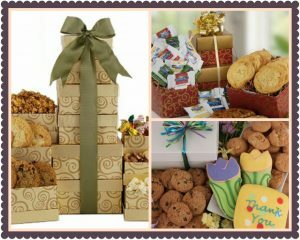 With so many yummy cookie bouquets to choose from, we’ve narrowed it down the top three to make your decision easier! Tell your mom she’s the bee’s knees with this adorable bee-themed cookie bouquet! With an assortment of adorably decorated cookies in the shape of bees, flowers, and honeycomb, this bee-eautiful bouquet is sure to please. This cute array of pastel lady bugs and flowers is the perfect gift to Mom from her little love bug. Lady bugs are a sign of luck, so tell Mom you’re lucky to have her in your life this Mother’s Day. This cookie bouquet is a new twist on a classic gift. 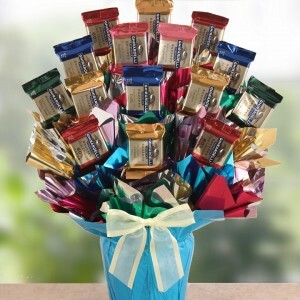 You’ve probably given your mom flowers every Mother’s Day, so this year give her a bouquet she can eat! This colorful assortment of oversized flower-shaped cookies is the perfect way to show Mom that you love her this Mother’s Day. No matter what you give her for Mother’s Day, you know that your mom will always love you, no matter what! 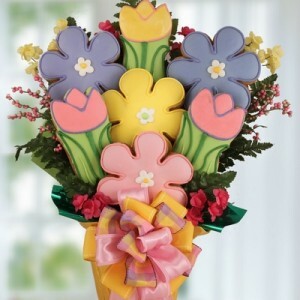 Show her you love her too by giving her one of the absolute best cookie bouquets from BisketBaskets.com! Let People Know Where Their Donated Money Will Go! The simple fact is, people are being asked for donations now more than ever. We are called on the phone, asked at cash registers, contacted via email, and shown compelling commercials on the television. It can be financially impossible to support every cause we believe in, but most of us are still very charitable people who want to help the best we can, as long as we know where the money is going. Will you be hosting a raffle this spring? We wish you the very best! And if we can offer one tidbit of advice, we encourage you to simply let people know where their money will go. You don’t have to get super specific – a general overview should suffice! If buying raffle tickets benefits a school sports team, supplying them with money for new equipment or uniforms, put that right on your flyer beneath the picture. Is your raffle money going toward a new air conditioner or carpeting for the church? Let people know! We truly believe there is more good in this world than is often noticed, and that people simply want to know what they are putting their money toward before they do it. And, of course, having an awesome raffle prize is an incentive as well! 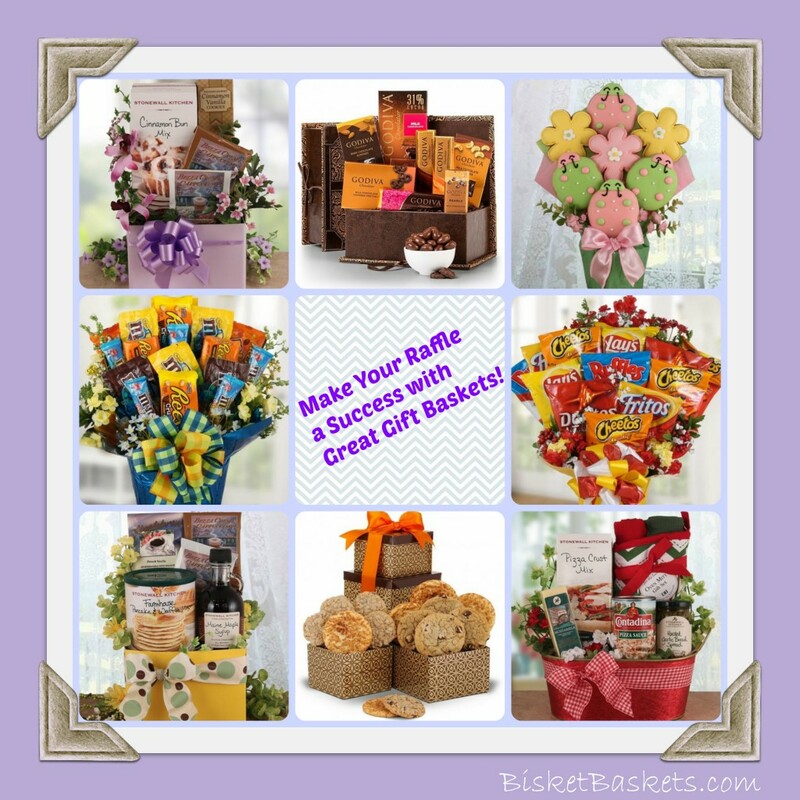 Many of our gift baskets and cookie bouquets are ideal for spring raffles. They are eye-catching, colorful, packed with tempting treats, and have near universal appeal. We hope you’ll consider including one or two in your next raffle, and wish you the best of luck in surpassing your goals! It’s an unfortunate fact that during this time of year, many of us are going to be forced to endure some manner of illness or minor injury. Working in an office setting, school, or any other confined space typically results in one person catching something and inadvertently passing it along to everyone else. Similarly, shoveling mountains of snow more often than anyone would like leaves backs and shoulders feeling less than awesome! That said, I thankfully don’t get sick as often as I did when I was younger and worked in a retail environment. Being a cashier during cold and flu season was not fun at all, with every other customer sniffling, sneezing, or looking as though they could benefit from some medicine and a nap. The simple fact is, unless you don’t leave your house at all, chances are good that you’re going to battle a bug or two that will throw the brakes on your busy schedule and demand some rest and relaxation. And as much as that is not a fun thing to tackle, it’s oh-so-much better if you’ve got something sweet to eat. 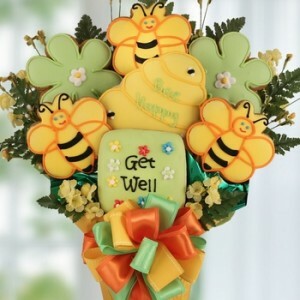 That something sweet is exactly what our delicious Get Well cookie bouquets offer! If you’re feeling less than swell yourself, treat yourself to some Get Well cookies. Know someone who is spending more time curled up on the couch than their cat does? 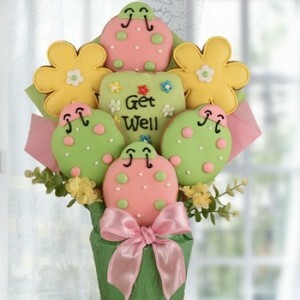 A Get Well cookie bouquet will be a welcome ray of sunshine for them as well. Cookies may not be the cure for all the woes in the world, but they certainly help! This Valentine’s Day is for Secret Singles! When the Christmas season rolls around, one of the events I get most excited about is ‘Secret Santa’ at work. If you aren’t familiar with Secret Santa, which is similar to a white elephant gift exchange without the swapping, the rules are simple. Everyone who wishes to join in the fun puts their name in a bucket or basket. Once everyone’s name is in, everyone draws a name and buys a present for that person. Of course, if you get your own name you choose again. Then, at an agreed upon day and time, all gather together to exchange gifts. Sometimes people will opt to say who bought what before the gifts are opened, but often it is more exciting to put the person’s name on the present and not let anyone know who bought what until the exchange is over. In short, it’s great fun for all, and the perfect excuse to order a few pizzas! So what does all this have to do with Valentine’s Day, you’re likely wondering? Thinking about how much fun Secret Santa is got me thinking of a similar concept for February 14th. Most often regarded as a holiday for couples, Valentine’s Day can leave singles feeling a bit lonely. Even if you aren’t really upset about not having a special someone on Valentine’s Day, it’s easy to feel a bit down when it seems everyone else is receiving Valentine’s gift baskets, Valentine’s flower bouquets, boxes of chocolates, or even a new puppy or kitten! But I have an idea that should help make Valentine’s Day more fun for singles. And it’s similar to Secret Santa. Without further ado I present… Secret Singles! The rules are simple. Send an invite to your single friends and/or coworkers and see if they’d be interested in picking their secret Valentine’s name from a basket. Since it’s just a friendly thing, it doesn’t even have to matter if the person they choose is male or female. Just like they would for Secret Santa, they’ll buy a special Valentine’s Day treat for their Secret Single, knowing someone is buying one for them as well. 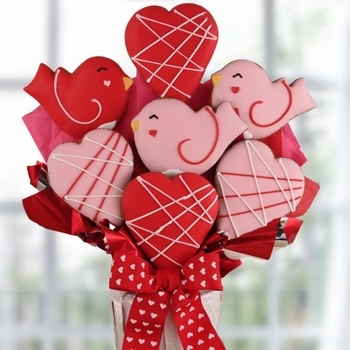 Some of our favorite ideas from Bisket Baskets would be the Red Hot Valentine Care Package, Cupid’s Delight Gift Tower, and Be My Tweet Heart Cookie Bouquet. All are packed with goodies, less than $40, and not overly romantic. What do you all think? Is Secret Singles something you’d be interested in trying?